Boston, Mass., November 19, 2012 – Pri-Med, the leading provider of professional medical education to a community of more than 260,000 clinicians, today announced the purchase of Amazing Charts, a leading provider of electronic health records (EHR) to independent medical practices. As an independent operating subsidiary of Pri-Med, Amazing Charts will continue to offer its intuitive and affordable software solutions to clinicians, but now will have the resources to accelerate product development and the geographic reach of Pri-Med’s medical education conferences in 30 cities nationwide. Dr. Jonathan Bertman, founder of Amazing Charts, will continue to serve as President, with Kathleen Repoli serving as Senior Vice President. Other terms of the deal were not disclosed. With Amazing Charts, Pri-Med gains a next-generation medical education platform strategically located at the point of patient care, enabling it to deliver CME activities where and when decision support is needed. Click here to watch John Mooney and Dr. Jon Bertman discuss their vision for this unique partnership and how it came to be. 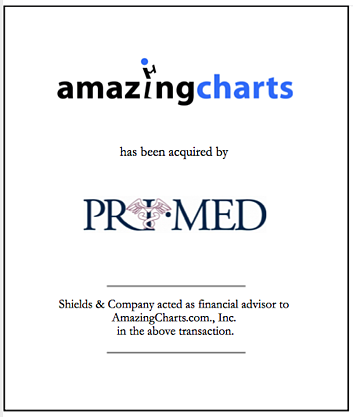 Shields & Company acted as a financial advisor to AmazingCharts.com, Inc. in the above transaction.